Official Website Check our the Myspace page here! Debut album mixes passionate vocals with blends of pop/rock, jazz and blues to make the perfect top 40 martini. Sit back and listen to one mans journey as he breaks the walls and lets the light in. 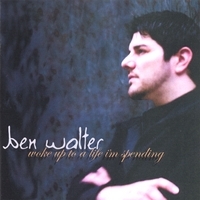 In his debut album “Woke up to a Life I’m Spending”, Ben Walter enchants with a soothing voice and a unique, soulful style. Through thoughtful lyrics, his gentle, melodic music takes the listener on a journey through the mind of a young man coming into his own. Discovering his passion for music at an early age, Ben began singing as a child and has never stopped. With over 12 years of experience performing at various events and clubs, he delivers a show that cannot be missed. His blend of piano, pop, rock and jazzy blues will catch your ear, but it is his honest, emotion filled words that will make you a life-long fan. I love the CD. Beautiful voice. Very expressive. Actually, I liked the response from the CD company about my receiving my CD. It was humorous. I received it in a few days. So, thank you! I've never heard of Ben Walter before, but now I do and his CD is wonderful. However, I don't care for the way the words to the songs are all mixed together in one huge paragraph. Otherwise, great CD and artist!! I played this CD while relaxing alone one evening and the music just flowed with the moment. I can't wait for the next relaxing evening to listen to it again and enjoy. This CD seeks out your soul and embraces it! You can feel the emotions lingering in the air. AMAZING! Buy this CD its fantastic. Well produced good wholesome music.I love House On a Hill and Goodbye. Great songs very moving and upbeat. The whole CD is fantastic check it out you will see. After stumbling into Ben's music at MySpace, I just had to get his CD. His music is extremely easy to listen to, very soothing, yet the message is so profound, so deep. Music so beautiful, one can't help but listen. I jus met Ben Walter a short time ago. But He's made the largest impact on myself. His lyrics touchs the soul, Its like floating on clouds. Ben & Sam Harris what a combo yet to be. Mahalo Ben & Kriss.. I have waited all my life to hear this from Ben!!!! I am drawn into the voice of this singer. I can feel his emotion as he plays the keyboards and sings his words. This artist is certain to go far! Love this CD. Beautiful music. Listen to it over and over again.